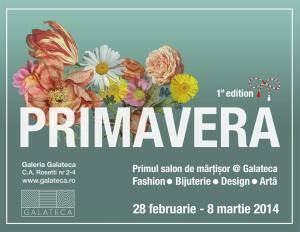 March starts with Primavera, the first edition of the Spring Saloon @ Galateca, bringing together fashion design, designer jewelry and art at convenient prices, between February 28th and March 8th 2014. If you are interested in the newest spring-summer collections of the most talented Romanian fashion designers, you are welcomed to discover the young creators and their beautiful clothes: Murmur, 109, Le petit indigent, Adelina Ivan, Claudia Castrase, Sandra Galan, Cristian Samfira, Atelier Atu, Mihaela Crețescu, Aerwear, Rad Playground and Florentina Giol. Wear them with wonderful jewelry designed by Expression (by Alexandra Ungurelu), Lady Magpie, Carla Szabo, Fashion Machine, Raluca Buzura, Moogu, Noha Nicolescu, Roua de argint. "Primavera" Fair in Bucharest. You can get here description, reviews, address, time and details of "Primavera" Fair in Bucharest. Visit Bucharest Tips for more Fair events in Bucharest!